My journal article, “Invisible and Instantaneous: Geographies of Media Infrastructure from Pneumatic Tubes to Fiber Optics” — drawn from research I conducted for my book — was just published in the journal Media Theory. Below is an excerpt. Please see the full text HERE. At the height of the dot-com boom in the late-1990s, technology entrepreneur Randolph Stark was walking home through his Wall Street neighborhood and saw crews digging up the street to lay fiber optic cables between the banks and the stock exchange. Stark was walking home from a tech meet-up in Manhattan. Earlier that evening, a colleague had mentioned to him that New York used to have miles of pneumatic tube lines that shot up to 20,000 letters a minute between Post Offices. On the walk home from the meet-up, as Stark was looking at the heavy machinery digging up the concrete and asphalt, it all seemed like an unnecessary amount of labor and cost – at about $1000 a foot – when the infrastructures were already there just a few feet beneath the hole that was being dug anew (Figure 1). He then envisioned a new business venture: running fiber optic cables in the old pneumatic tubes that were laid in the 1890s. This would allow companies, apartments, and office buildings to get faster Internet connections since the data would have less distance to travel. 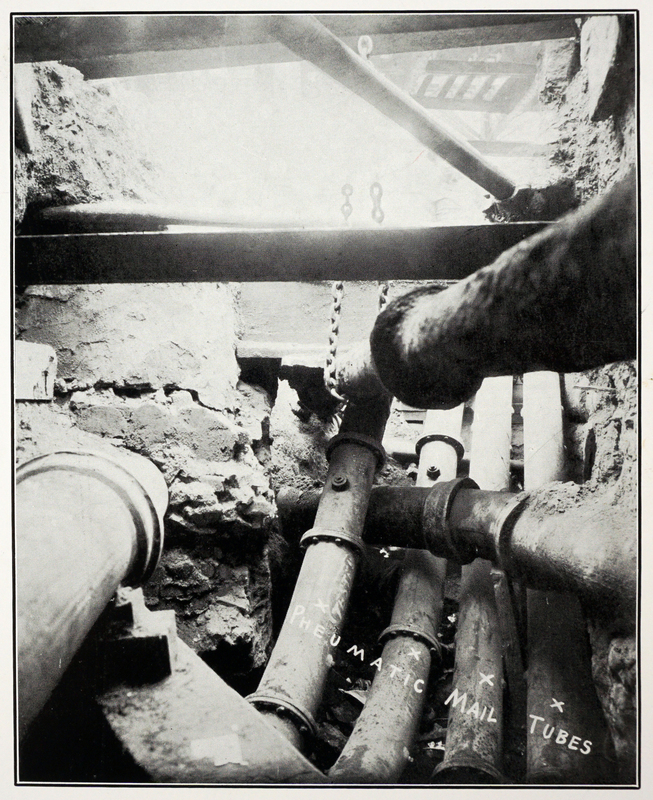 Figure 1: The ganglia of pneumatic tubes beneath the streets in New York City at the intersection of 17th Street and Sixth Avenue, 1906. Image courtesy of the National Archives, Washington, D.C. There are moments in history when technologies allowed us to connect with each other at unprecedented speeds. These moments gave people the ability to send messages at rates that seemed to eliminate waiting altogether. The rise of the pneumatic tube mail system was one such moment. Cities across the country were clamoring to install pneumatic tube mail systems. Sending mail in canisters pushed by compressed air under the streets of a city was seen as the essence of being cosmopolitan and modern. Pneumatic tube systems were not simply an efficient way to deliver mail and packages across cities with congested streets now packed with automobiles; instead, they were symbols of modern life. Pneumatic tubes represented a technological leap forward allowing us to connect instantly. The geographic placement of the tubes, underground and out of sight in urban centers, helped fuel a cultural imaginary around the idea of “instant messaging.” The pneumatic tube geographies were central to their success and shaped the way that the medium was not only used from day to day, but also how the public imagined the role of this new medium in their identities at the turn of the twentieth century. The underground placement of the pneumatic tubes served two purposes. First, it was practical, allowing the message canisters to be sent throughout the city without interrupting life above the surface. The ability to send messages without dealing with the crowded city streets or severe weather was one of the main selling points of the pneumatic tube system. It could deliver consistent speeds regardless of how congested or impassable the streets got above. Second, by being out of view, it allowed the imagination to create a mysticism around the system that could be totally disconnected from the physical reality of the pneumatic tubes. 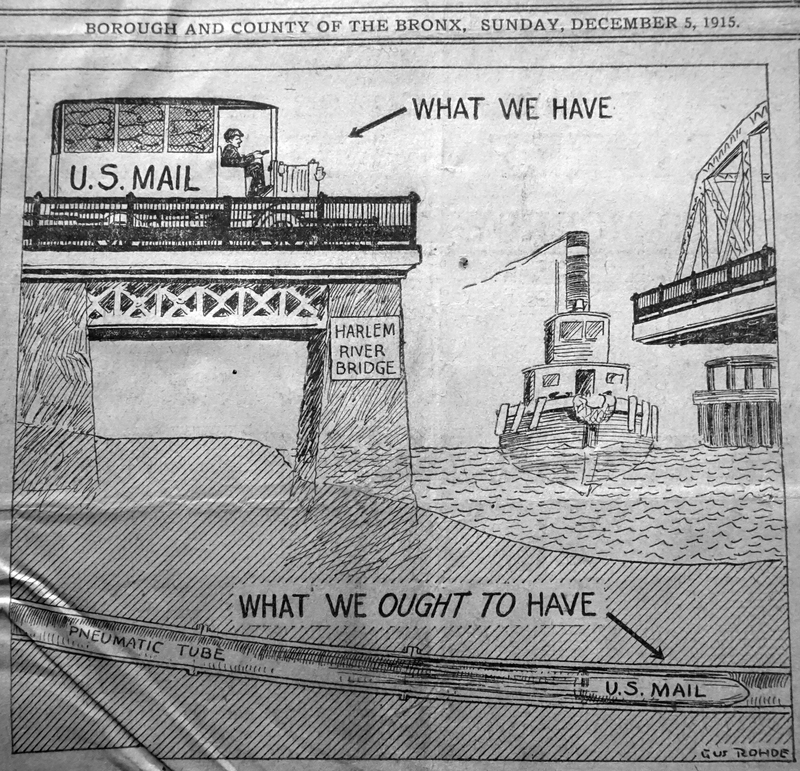 For example, in a newspaper cartoon from 1915 that advocated for extending the system, it shows a clunky mail car stuck at a bridge crossing while a missile-shaped canister filled with mail shoots through a tube under the river. The cartoon contrasts these by saying “What We Have” next to the mail car, and “What We Ought to Have” next to the mail-missile (Figure 2). Figure 2: A drawing published in the Bronx Home News published on December 5, 1915 comparing the clunky automobile and its limitations with the futuristic (and militaristic) missile of the pneumatic tube canister being shot under the Harlem River. Sending mail in canisters pushed by compressed air under the streets of a city was seen as the essence of being cosmopolitan and modern. Image courtesy of the National Archives, Washington, D.C. In this article, I explore the ways that “instant connection” through a messaging technology had a powerful cultural allure, regardless of whether or not the systems could actually connect people instantly. Instantaneous communication is still an enormously powerful concept in our own culture. It is the motivator behind that feeling that we are unable to leave the house without our phone for fear that we’ll be out of touch. Being able to reach out and connect instantly, without the need to wait, is a dominant touchstone for our era. The seeds of this enchantment of the instant were planted back in the mid- to late-nineteenth century with the launch of the telegraph and the pneumatic tube systems. Yet, this notion of instantaneous communication is a mythology that drives consumer attitudes more than it delivers a wait-free mode of communication. That is to say, the ways that this enchantment changes how we think are more powerful than the technological abilities of the system itself, whether that be text messages on a mobile phone or pneumatic tubes shooting messages around a city.